AMD started using the ARM license(s) by embedding ARM Cortex A5 cores into some of their x86 processors to add TrustZone security, followed up with Opteron A1100 ARM Cortex A57 processors for servers, and now they’ll soon ship AMD Embedded R-Series SoCs featuring up to 8 Cortex A57 processors. The processors, codenamed “Hierofalcon”, target embedded data center applications, communications infrastructure, and industrial solutions. The SoC is probably mostly targeting headless applications since there’s no embedded GPU, but you could still probably add a graphics card via PCIe if needed. 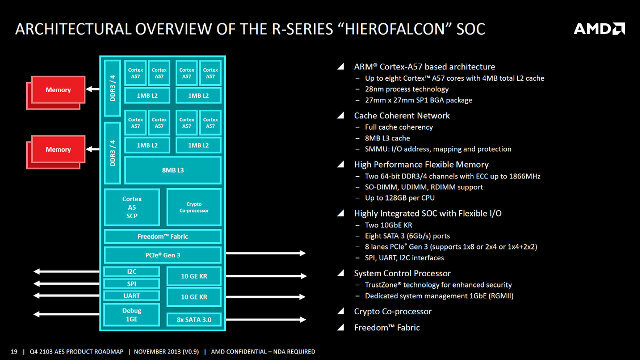 In October 2014, we began sampling our first 64-bit ARM Cortex-A57-based AMD Embedded R-Series SoC, codenamed “Hierofalcon.” The AMD Embedded R-Series SoC platform is designed for embedded data center applications, communications infrastructure and industrial solutions and is expected to ship in the first half of 2015. Same die as Seattle, just a tad more embedded version, but of course all you do is stick an Radeon on it, and there is pretty much the most FLOSS-like ARM system. Hopefully there will be boards using that SoC similar to the Gigabyte’s X-Gene 1 boards. The WCCFTech article also mentions K12, a custom ARM processor by AMD that should be manufactured @ 20nm. Not sure about the exact process though. Wake me up when I can actually buy an ARM SOC made by AMD. So far all they have is announcements. This could be used in 96Boards Enterprise Boards, which should be out in Q2, sub-300 USD. Would be quite decent. On the topic of changes to the site, reconned using a responsive CSS framework like bootstrap. It’s difficult to read the article and connects without zoning in and it on s mobile currently. I’ve upgraded my website cache plugin, and enabled WPTouch add-on.